The RCM Flo-Gage is a direct reading liquid flowmeter and gas flowmeter with a large easy to read dial calibrated in engineering units (GPM, SCFM, LPM, etc.). The Flo-Gage is suitable for measuring water, oil, and most low viscosity liquids as well as compressed air, oxygen, carbon dioxide, nitrogen and many other non-toxic compressed gases. Saturated steam can also be measured up to 120 psig max. The flowmeter is self contained and complete. Available in threaded and flanged connection. Liquid meters are suitable for potable and non-potable water, irrigation water, glycol-water mixtures, fuel oils, lubricating oils, gasoline and many other low and medium viscosity liquids (maximum viscosity 500 centipoise). 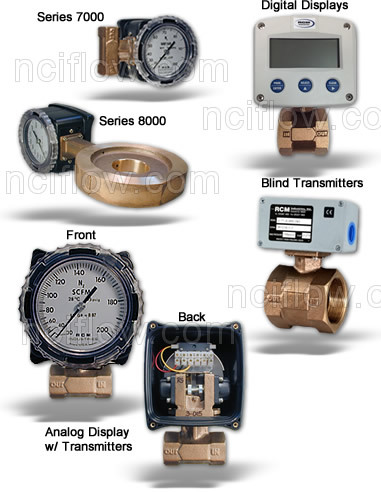 All meters are available in either threaded or flanged connections and in Bronze, Monel or 316SS. Monitor correct cooling flow to machinery. Protect valuable equipment by using a low flow switch to shut down machinery before damage. The Flo-GageTM will not foul with small debris frequently found in cooling systems. Fouling can cause typical flow switches to stick and fail to detect low flow conditions. Flo-gages are ideal for measuring lube-oil. They do not require that the oil be transparent to be measured. Low flow switches can add additional protection. Proper flow of cutting oil is essential to machining operations. Automatic machines which run unattended require monitoring of the flow of cutting fluids. The gage allows quick setting of the proper flow rate. The low flow switch can stop machines before bad parts are produced or equipment damaged.